Psychic Training from End to End! Pathways to Clairvoyance Psychic Certification provides guaranteed boosting of the psychic senses and honing Clairvoyance skills. Ultimately, you’ll learn step-by-step how to do fantastic professional psychic readings. You’ll develop your Clairvoyance to high level of mastery. Locate your strongest psychic *”clairs”. Find out which psychic senses are your strongest. Moreover, you’ll learn the mystical secrets that the Ancients knew about the Third Eye, how it ties in with Clairvoyance, and how to open it to its maximum potential. Significantly, you’ll learn which is your strongest psychic sense. 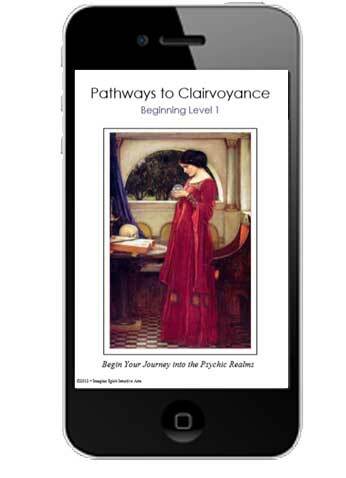 Following this, you’ll discover how to quickly increase and master all your psychic abilities. You’ll learn valuable ways to open your Third Eye. And, you’ll learn about the Pineal and Pituitary Glands which govern your third eye. Importantly, you’ll find out how to clear any blockages in your Third Eye. Additionally, you’ll learn how to manage your psychic Chakras and expand your Aura to further increase your psychic powers. 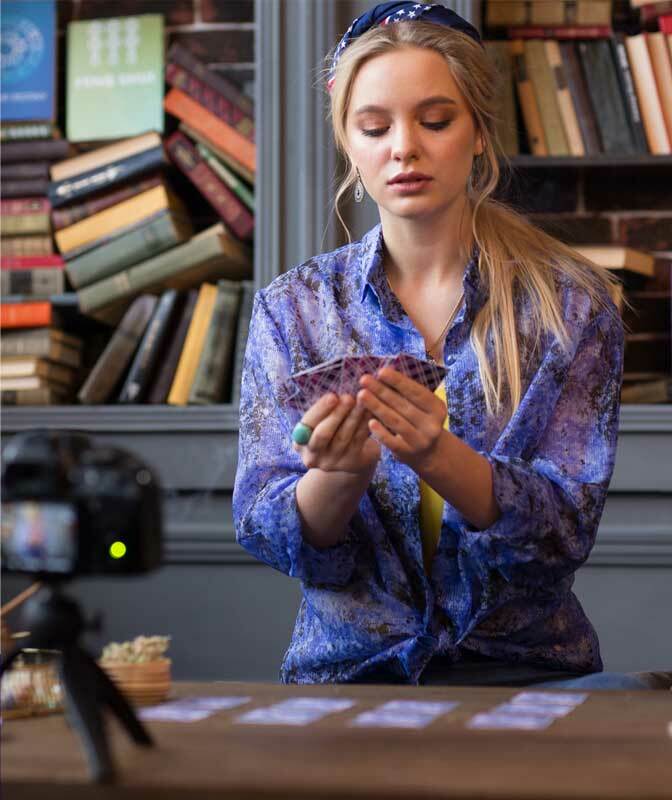 Finally, you’ll learn step-by-step how to do professional psychic readings. You’ll have access to movies to show you how! Read any Oracle Cards easily. Learn how to do professional psychic readings. Having Live Class Recordings is like being right in a classroom. The recordings you receive come from an actual Psychic-Clairvoyance phone class. Get course as an Immediate Download or Printed. Printed handbook is 3-hole punched with beautiful color cover. Binder not included. 18 live class MP3 recordings and development exercises. Electronic handbook file for any device. What’s more, receive help from Carol by email request. Learn about Astral Projection and the Silver Cord. Add to that, an introduction to the Akashic Records. Master psychic protection. Stay energized reading after reading. Access higher dimensions with Sacred Geometry. You’ll how to go into deep Theta trance. Understand Chakras 1 through 7 and how to clear blockages. Utilize out-of-body Chakras 8 through 12 for greater spiritual connection. How to see auras and interpret color meanings. Read about psychic protection and how to shield from others’ negative energy. WHY STUDENTS LOVE THIS PROGRAM! Thanks Carol for introducing me to the world of psychic development. I was so afraid in the beginning that I couldn’t develop any skills. I’ve found out that I have more psychic abilities that I ever dreamed of. And, my Clairvoyance is off the charts! This course was so amazing, I was able to begin a new business as a spiritual counselor in just 6 months. I now help many that have retired from the military to find new directions. This is the best psychic training course I’ve ever seen. It’s helped me with my teaching and enabled me to envision future possibilities. I’m looking foward to taking the Mediumship training next. Thanks Carol! There are many wonderful Oracle Card decks you can purchase. Find one that vibes with you. Or, use your own Tarot deck if you already know how to read Tarot. (This course does not yet involve teaching the Tarot, but very soon Imagine Spirit will be offering an on-line Tarot course. Also, you will need a pendulum for this course. You can easily make one. We’ll tell you how. Additionally, a medium size mirror. This is optional. *Oracle card decks can be found at any metaphysical bookstore or regular bookstores. You can also find them on Amazon.com. Most sell for around $14-$18. How can I practice doing readings? I suggest that you practice the layouts presented many times over before trying them on someone else. The earmarks of a great intuitive counselor, or any kind of reader, is someone who appears confident and can move through a reading smoothly without frequent hesitation or overly pondering the cards. Once you feel comfortable and thoroughly know a few layouts, ask friends if they are willing to have a reading. For the friends that are willing to get a reading, let them know you are practicing your new skills. Also, it’s great to get feedback Keep any feedback from your readings so you can put them on your website or Facebook page if you need testimonials. Be sure to get permission. Yes. It’s absolutely safe! Developing the psychic senses and opening the Third Eye is not dangerous despite what some people may claim. Your psychic senses are already inherent within you. With this course, you’ll just be strengthening and gaining greater mastery over them. Additionally, going into deep meditation is actually beneficial. Meditation is nothing more than achieving a deep state of relaxation. Are there movies and what are they? Yes! There are an abundance of movie links on topics such as giving readings, setting up your Psychic Table, numerous layout spreads explained, how to use a pendulum for Yes/No answers, easy Yes/No answer spreads, how to determine timing, and much more! Do you teach how to get started in a business? Yes. As mentioned, this will be covered in the course and additionally, you’ll receive a How to Market Yourself eGuide. 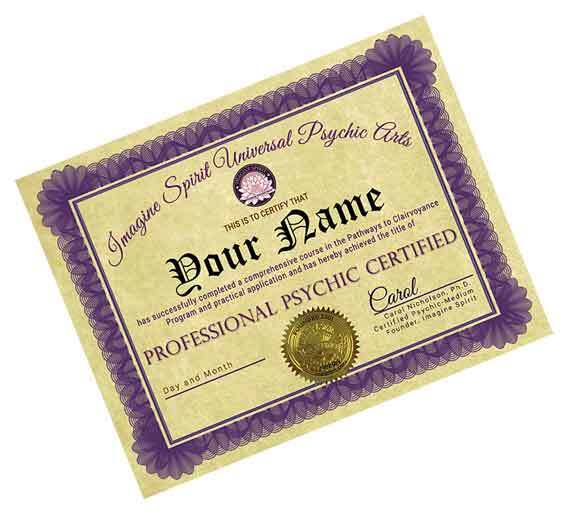 Download Option: You can download your Psychic-Clairvoyance files to a cell phone, tablet, or computer. Printed option: With the printed option with files DVD, move your files to your device as needed. Electronic files are provided for android and iPhones. The ePub file supplied works on a Kindle. Download of All Course Files Option A. Receive Two Sources for Obtaining Your Files! You can download to multiple devices what you want and when you want. Printed Handbook+ Download of All Files C.
*Clairvoyance, Clairaudience, Clairsentience, Clair-empathy, and Claircognizance.